On December 6th each year, Canadians remember the 14 women who were violently murdered in 1989 in Montreal, Quebec. The École Polytechnique Massacre, also known as the Montreal Massacre, occurred on December 6, 1989 at the École Polytechnique in Montreal. Twenty-five year old Marc Lépine, armed with a legally obtained Mini-14 rifle and a hunting knife, shot twenty-eight people before killing himself. He began his attack by entering a classroom at the university, where he separated the male and female students. After claiming that he was "fighting feminism" and calling the women "a bunch of feminists," he shot all 9 women in the room, killing 6. He then moved through corridors, the cafeteria and another classroom, specifically targeting women to shoot, killing 14 women and injuring 10 other women and 4 men in just under 20 minutes before turning the gun on himself. Lépine was the son of a French-Canadian mother and an Algerian father. He had been physically abused by his father. His suicide note claimed political motives and blamed feminists for ruining his life. The note included a list of 19 Quebec women whom Lépine considered to be feminists and apparently wished to kill. 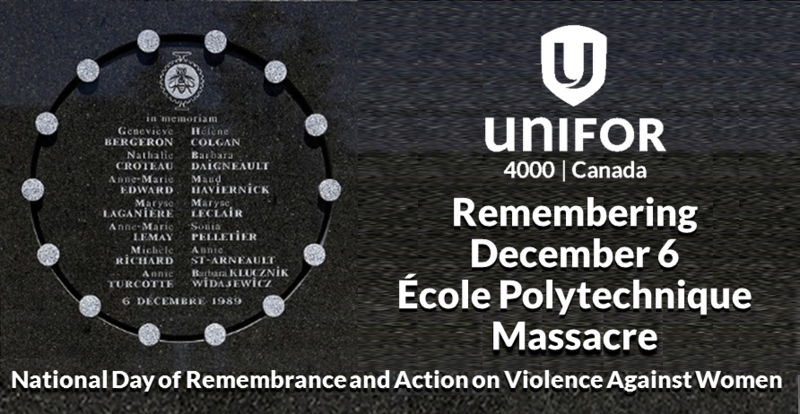 Vigils will be held across Canada this December 6th to mark the 26th anniversary of the massacre at Montreal’s École Polytechnique.